As a military family, we have moved a lot in our adult years so I thought I’d share a few tips that have helped keep me sane. 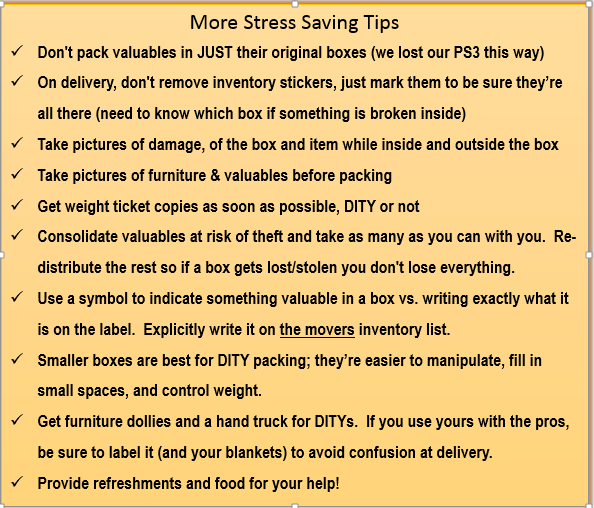 We’ve done it just about every way; professional movers, partial do-it-yourself (DITY), and full DITYs so I hope these suggestions will help no matter what method you choose. The major considerations for whether to move yourself or hire professionals are the same as for most big decisions in life: cost, stress, and time. Professional movers are pretty much always more expensive. If you have limited packing supplies (moving blankets are expensive! ), need a specialty rental truck, or need interim storage, it might come close. If you’re military, or with another organization where you have relocation covered (or reimbursed), it will be hard to beat the rates they get if you hire a professional yourself. This is especially true if you exceed your allotted weight (which you may not know until it’s too late). We tried this by packing all our own goods and hiring someone to just move it, store it, and move it again. We made money in the long run, but I was terrified based on the responsiveness (or lack thereof) of the company while our goods were in storage that we might never see them again. Remember that if you’re going through your corporately hired movers, they usually include all packing materials and labor (packing, dis-assembly, unpacking, and assembly) as well as insurance, which leads me to the next consideration, stress. They key insight you need to have is what is going to stress you out? Are you the kind of person who can suppress that nagging feeling someone is stealing all your power tools or are you going to be thinking about it non-stop until you open the box and see them? Would it be stressful to risk that costs exceed your reimbursement, or that valuables break with no insurance, or that you won’t meet your timeline because you underestimated how long it takes to pack? Sometimes stress-prevention is worth its weight in gold. Preparation and communication are key, and a little research and investment in the proper supplies will pay off. However long you think it will take you to pack your household goods, double it. There will be more than you expect and if you want to sort and label in any reasonable way it just takes a long time. If you have less than a week for a home over 1200 square feet you probably better hire some help. Professionals save time because they bring a crew, but also because they don’t sort or label like you would. They don’t skimp on supplies, but will fill a box with everything close that fits and label it for the room they packed it in. That may be fine when everything from one cabinet ends up in the same box, but not when four or five drawers get packed together. If the professional movers are on your dime, be sure to monitor for full boxes since you’re paying for every single one. If they’re using any of your packing supplies (esp. moving blankets) be sure to label them so there’s no question when unpacking which were theirs. At your destination, you most likely will not have them unpack boxes, just furniture. Extra time you spend sorting and searching may be worth the time you saved having them pack.